More parents are passing on bad habits when giving their children driving lessons, a survey shows. Fifty-two per cent take out sons and daughters with L-plates – double the number who were themselves taught by their parents. But 45 per cent fear their children will pick up unsafe practices from them including speeding, failing to check mirrors and not using a seatbelt. And 37 per cent of learners aged 17 to 21 say they have inherited risky habits. Just 22 per cent of learners believe their parents are good enough drivers for them to benefit from their help. 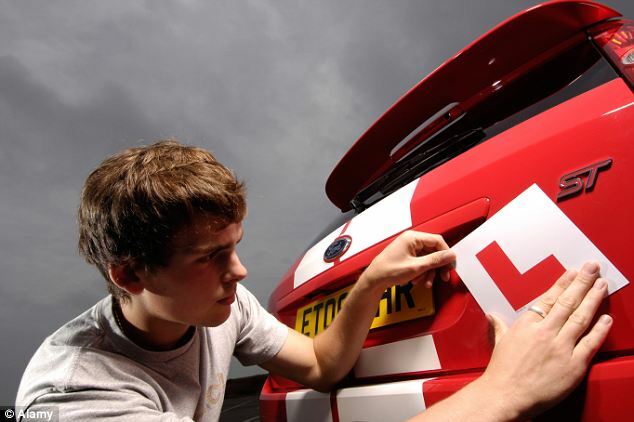 The poll of 1,705 parents and 373 young learner drivers commissioned by insurer Admiral found that nine out of ten have lessons from a qualified instructor. Forty-two per cent of parents who offer extra lessons do so to save money and 55 per cent want to help children get a full licence sooner. But 18 per cent of parents who refuse believe they set a bad example and half say a driving school is the best place to learn. Crossing hands whilst steering was the most common bad habit followed by exceeding speed limits, failing to use the handbrake when stationary and omitting to check mirrors or indicate. The survey exposed a generation gap between parents and youngsters on the road to motoring adulthood. Fifty-seven per cent of parents taught by their own parents say it helped them become a better driver. But just 22 per cent of learners believe that their parents are good enough drivers for them to benefit from the experience. And only 47 per cent of parents are confident that they themselves could pass a practical driving test today. The likelihood of in-car also rows puts a brake on lessons and 50 per cent of teenagers who are taught say sessions often end up in angry confrontations. Thirty-seven per cent of those refused extra lessons in the family car also gave the certainty of arguments as a reason for going it alone. 'There are definitely benefits to giving additional lessons to your children but it’s important to notice your own bad habits and not to pass those on,' said Admiral’s managing director Sue Longthorn. 'It can help them learn more quickly and, hopefully, spend less on driving lessons. However, it is always going to be a minefield as personalities clash and this often results in arguments. 'It’s a good idea to let your son or daughter have some lessons with a qualified instructor before venturing out with them. The survey revealed that fathers are more likely than mothers to take children out for lessons. Fifty-two per cent say their father takes them out most often compared 35 per cent whose mother is the principle teacher.